A couple of the calls I’ve had recently have been about waxwings that don’t seem quite sick, but act strange and allow people to pick them up–they seem, well, somehow they seem drunk. And that’s exactly what some of them are. If cold weather stops the flow of fresh sap to mountain ash berries and then there’s a thaw, the sugars in the berries may ferment. If a waxwing eats too many, it gets roaring drunk, staggering about on the ground or in the air, vulnerable to predators and accidents. If you find a drunk waxwing, it’s often a good idea to give it food and shelter until it dries out. Just remember that like all native American songbirds, waxwings are protected by law. As tempting as it is, they cannot legally be kept as pets. That may be the first time I ever talked about intoxicated birds on the air. I’ve mentioned the problem of fermenting berries and other fruits many times in the three decades since then, but apparently most people were still completely unaware of the problem until the police chief in Gilbert, Minnesota, wrote a press release last week stating that people throughout town are finding intoxicated birds everywhere, and in their drunken state, the birds are colliding with cars and windows. That story went viral. The Duluth News-Tribune interviewed me about it, and soon I was fielding calls and doing interviews for CNN, KARE-11 TV in the Twin Cities, and even the New York Times. A local Fox News station in the Twin Cities called me. They needed a live interview, so I gave them Sharon Stiteler’s name—she’s the famous “Birdchick” and a park ranger down there, and she gave them a great interview. Some of the articles and TV spots used my photos of robins and Yellow-rumped Warblers, but some just did internet searches, which is probably why some were illustrated with European Robins, which aren’t even thrushes, and a Fieldfare, a Eurasian species which was found exactly once in Minnesota, in Grand Marais, back in 1991. The problem is, there’s no evidence that berries fermented early this year, and it’s usually not until late winter and spring that the sugars in old fruits reach that stage of fermentation. 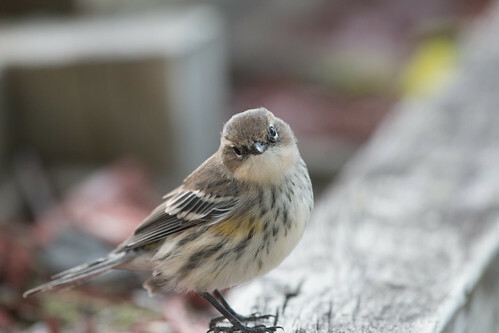 We’re having a huge songbird migration right now—I’ve had at least 60 Yellow-rumped Warblers in my yard at a single time much of the past two weeks, sometimes counting over 25 in my feeders simultaneously. 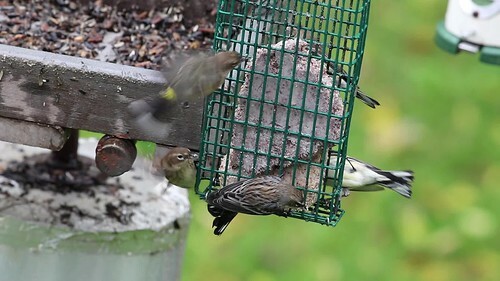 Except during these migration fall-outs, people seldom see these tiny little flutterers on the ground, and the way they hop and fly could appear weak and even drunken for those more accustomed to seeing the faster, more direct movements of heavier birds such as sparrows and juncos. 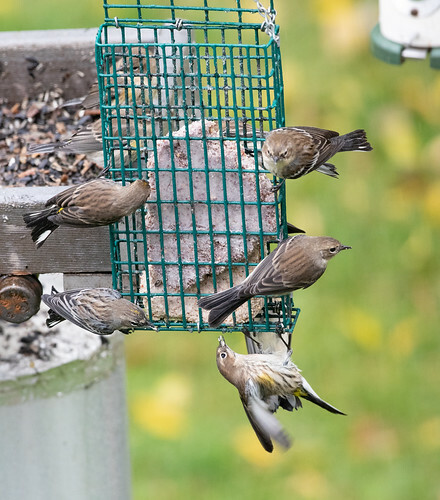 • “Drunk birds are causing havoc in a Minnesota town. Police say they’ll sober up soon.” — Washington Post. • “Drunk Birds Are Currently Terrorizing a Town in Minnesota” — Vice. • “Drunk Birds Can’t Handle Their Alcohol, Are Flying Under the Influence Around Town” — Time. • “Birds are getting ‘drunk’ off of berries and flying into windows, police say” — USA Today. • “Drunk Birds? How a Small Minnesota City Stumbled Into the Spotlight” — New York Times. The Twin Cities Fox News story got picked up nationally. Soon Sharon Stiteler was being featured on Ellen DeGeneris and Jimmy Fallon's monologue—the one silver lining to the whole story. Right now, there is too much scary and even horrifying national news for people to wrap their heads around, so I’m not surprised that the country reveled in a story about drunken birds in such a lighthearted, if inaccurate, way. If a national story about migratory birds was going to lead to any kind of understanding of them and how to help them, I’d be thrilled. As it is, this all turned out to be yet another news item I’d like to forget. Choosing a life path: wolf or chickadee?